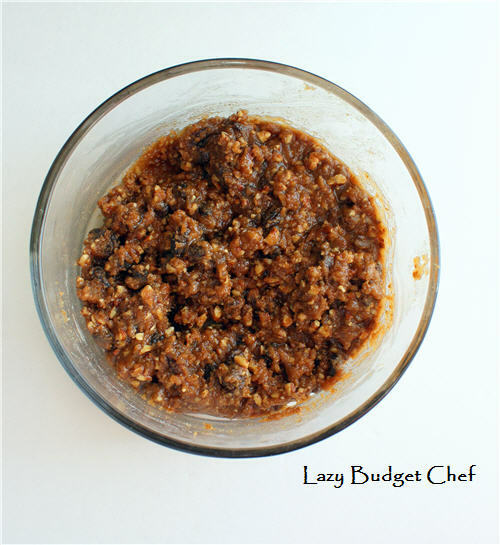 Lazy Budget Chef: How to Bake a King Cake – an Allergy Free Breadmaker Recipe! 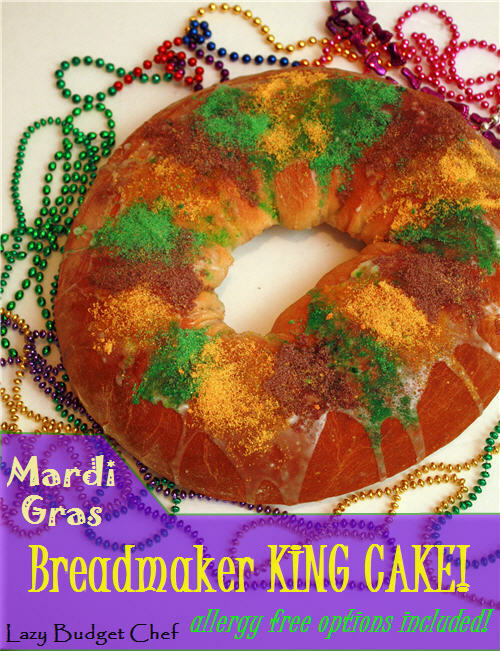 How to Bake a King Cake – an Allergy Free Breadmaker Recipe! One of the small regrets I had during a trip to New Orleans to eat! all! the! things! was not being able to sample King Cake. King Cakes are a lovely buttery coffee cake type cake with even more butter and cream in the filling, and decorated with icing or sugar (or both) in Mardi Gras colors: purple representing justice, green representing faith, and gold/yellow representing power. New Orleans style King Cake with a secret - it's dairy free! King Cakes are typically enjoyed during the Mardi Gras or Carnival season starting January 6th (Twelfth Night) to Fat Tuesday (Mardi Gras) and ending on Ash Wednesday. Each King Cake comes with a surprise inside. Somewhere inside the cake is a small plastic baby figure (or the more traditional dried bean or pecan) and if you are lucky enough to find the baby, according New Orleans tradition, you have to bring the next King Cake or host the next Mardi Gras party. Finding a King Cake in the French Quarter before or after Mardi Gras isn’t difficult. The tourist shops are full of Mini Mardi Gras King Cake you can buy here (I am including big bold affiliate links in this post for your convenience.) If you don’t want to wolf it down during your trip with a cup of Café due Mode chickaree coffee (which is our personal house brand of coffee. I buy Café due Mode coffee from Amazon here.) Most of the gift shops also sell Mam Papaul's King Cake Mix (this seems to be the local “official” New Orleans King Cake mix, by the way) so you can bake a King Cake when you get home. The problem is I’m allergic to the butter and milk in all of the King Cakes and mixes I considered buying while in New Orleans. Now that it is Carnival, I figured it was time to read a bunch of recipes (never do this on a empty stomach) and come up with my own milk allergy friendly King Cake recipes! Pin this post to your Pinterest Board for later! Share it with your friends! 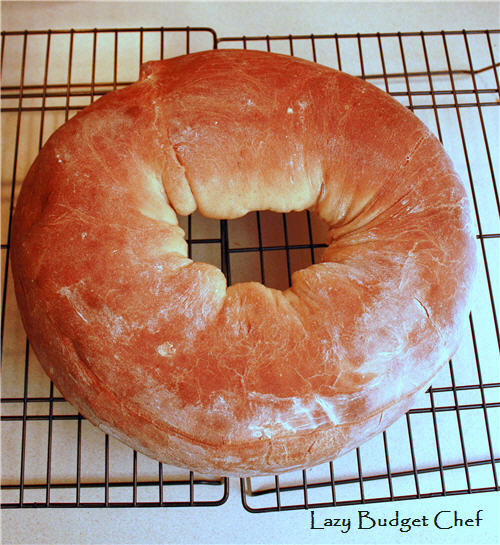 Since I have a horrible track record with yeast breads falling flat when I bake them by hand, I’m baking this dairy free King Cake in my bread maker. My no fail lazy way to get yeast breads to rise perfectly every single time! 1. Select the dough setting on your bread machine. 2. Add the ingredients in the order listed or according to the manufacturer’s directions. I listed the ingredients above in the order that my breadmaker prefers, your mileage may vary. 3. Remove the dough to a floured surface. Roll the dough into a rectangle shape that is approximately 24 inches long with a floured rolling pin. Warning: King Cake dough is a very sticky dough and can quickly turn into a hot mess unless you work with a floured or parchment or freezer paper covered surface. I used the flour on freezer paper for easier clean up. 4. In a separate bowl, make the King Cake filling. 5. In a separate bowl combine all of the King Cake ingredients and thoroughly mix them together to make a delightfully crumbly filling. 6. Spread the King Cake filling evenly along the rectangle of King Cake dough. If you want the filling n the center of each slice of King Cake, put the filling in one thick line on the dough. If you want the filling in a swirl like a jellyroll in each slice of King Cake, spread the filling evenly throughout the rectangle. There isn’t a right or wrong answer on this. You can spread the filling however you like! 7. Starting from one of the long sides of the King Cake dough and working toward the other end of the rectangle, roll the dough like a jelly roll. 8. 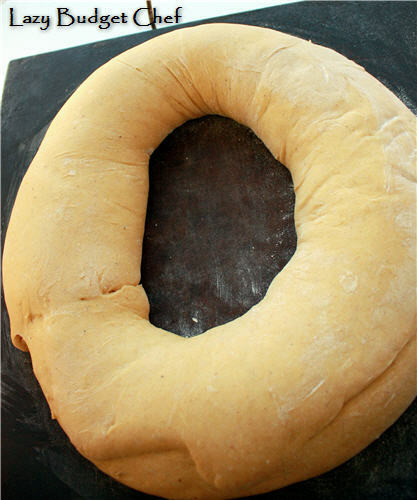 Place the rolled King Cake dough into a baking sheet or stone so it forms a ring. 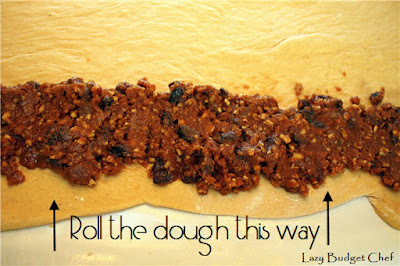 Pinch the ends together to form a circle of dough. Tip: Brushing a little bit of water onto the ends of the dough when you pinch it together and will act like ‘glue’ so the dough holds its shape while in the oven. 9. Insert the (non plastic) baby: If you are using a pecan, almond, or dried uncooked bean as your King Cake Baby press it into the bottom of cake and firmly into the dough and filling. I used a dried bean for my King Cake baby because I didn’t want to pull out the stepstool to grab a jar of nuts from the tippy top cupboard shelf. Do NOT bake a plastic King Cake baby figure! It will melt in the oven and ruin your cake and quite possibly your oven. Not to mention the whole possible danger of eating plastic blobs by mistake kind of thing. 10. Cover the cake with a kitchen towel and allow the dough to rise in a warm area for one hour. This is the part of every yeast dough recipe that I epic fail at because my dough doesn’t rise and double in size. I put the baking stone with my dough ring on top of the oven after I preheated it. It was a timing error but I think the hot oven was a warm enough place for the dough to rise enough so it doubled in size when I baked it. Or it was a massive fluke that wasted a lot of electricity. 11. Bake the King Cake for 30 minutes in a 375 degree (F ) oven. Second line around the house while the cake bakes is optional but a lot of fun! 12. Remove the King Cake from the oven and allow it to cool before you decorate it. So massive I had to use two baking rakes to cool it! 13. Insert the plastic baby: If you are using a plastic King Cake Baby press it into the bottom of cake and firmly into the dough and filling. 14. 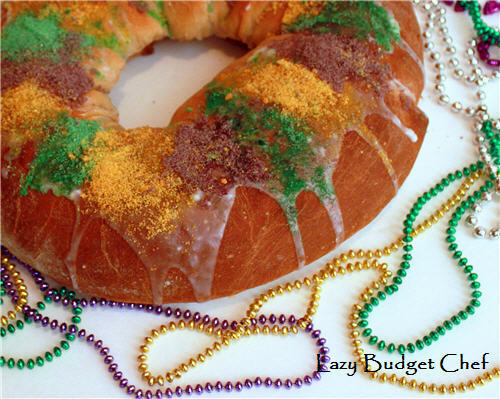 Make the white King Cake frosting and drizzle it onto the top of the King Cake. Add the water to the powdered sugar and stir until the icing is at your preferred consistency. Yellow: Mix 4 drops of yellow food coloring into 1 tablespoon of white sugar. Green: Mix 4 drops of green food coloring into 1 tablespoon of white sugar. Purple: Mix 4 drops of red food coloring and 1 drop of blue food coloring into 1 tablespoon of white sugar. If you use either artificial food coloring or natural food coloring when you want to make colored baking sugars. 16. Mix the food coloring into the sugar with a spoon or pour everything into a plastic baggie and completely knead the food coloring into the sugar with your hands through the bag. All the liquid or paste food coloring to dry a bit. 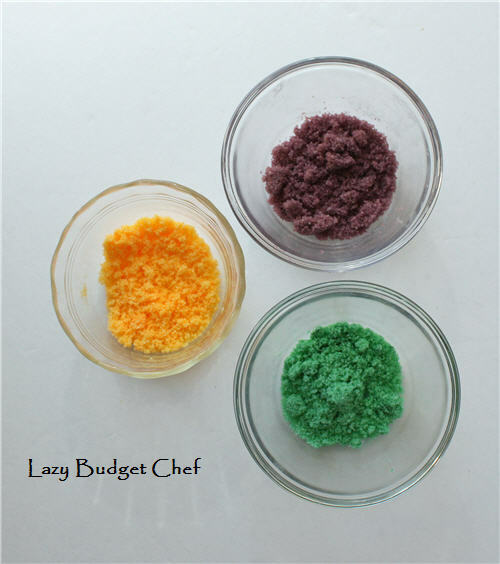 This will make it easier to sprinkle the colored sugars. 17. While the icing is still wet, decorate the King Cake with alternating bands of yellow, green, and purple sugar, sprinkles, or icing. I streamed Treme on Amazon Prime here while I baked and cleaned the kitchen. The music in this series is phenomenal! 18. Slice and serve the Mardi Gras King Cake to your family and friends to find out who need to make the next King Cake! I served up my dairy free King Cake to my friends and they loved it. Most of them didn’t have any idea I didn’t use cow’s milk or butter in my recipe. They just wanted seconds!